Thanks to Lee Funderburg for suggesting this hotspot. Thanks to Josh Hargrave for suggesting this hotspot in the Grand River-Lower Watershed Important Bird Area. Thanks to Rob Thorn for suggesting this hotspot and for providing tips for birding the trail in the park. Thanks to Scot Long for suggesting this hotspot. Fox Lake Road traverses privately owned properties. Please view birds from the roadside only. 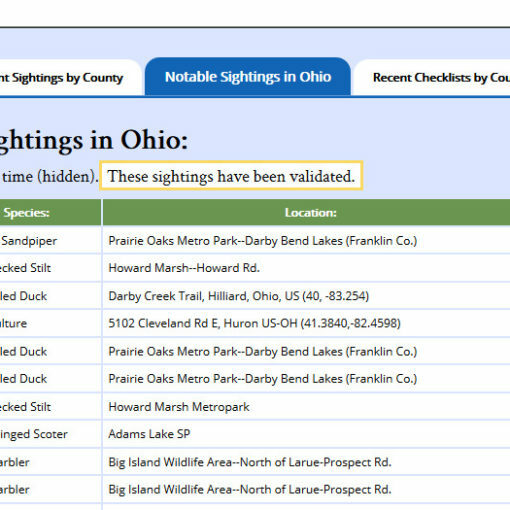 On the home page and on each county page, the list of Top Birding Locations has been updated with the latest total number of species seen at each location. We have added the community name to this hotspot to distinguish it from a similarly named park in Pataskala. Several parks in Licking County were named to honor T. J. Evans.